In animals, form and function are closely related. 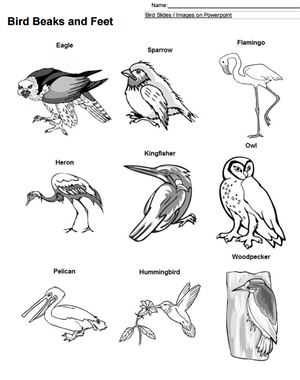 This concept is illustrated very simply by looking at a variety of bird species where the shape of the beak and feet provide clues to the environment the bird lives in. The worksheet includes images of birds to be studied, but is more engaging if the instructor shows the slide presentation with photos of real birds, like hawks and pelicans. I also have a few bird models in the class, a stuffed (real) red-tailed hawk, plus a few fake stuffed birds that have authentic bird sounds, like a black-capped chickadee. The lesson also goes further to discuss the idea of niches and how no two species can occupy the same niche (also known as the competitive exclusion principle.) Discussion questions ask students to compare three types of birds, a loon, a heron, and a kingfisher with regard to how they hunt. Since each bird hunts in a different way, it reduces competition between the three species which also live in the same general habitats. I like the pictures you used.